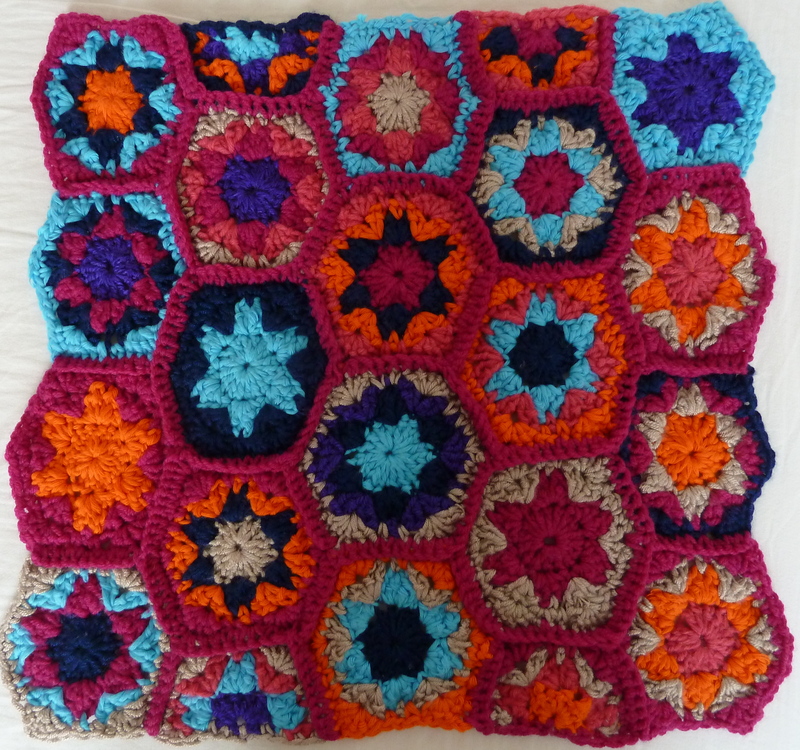 What do you get if you crochet a whole heap of my Leilah hexagons and put them together (along with a few handy half-hexagons to square it off) ? This of course! I tell you what, it took an absolute age to weave in all the ends, but I think the finished product will be worth the RSI. The colours might be a little eccentric, but that’s precisely how I like it. It would look completely different in more muted shades… monochrome might be interesting. 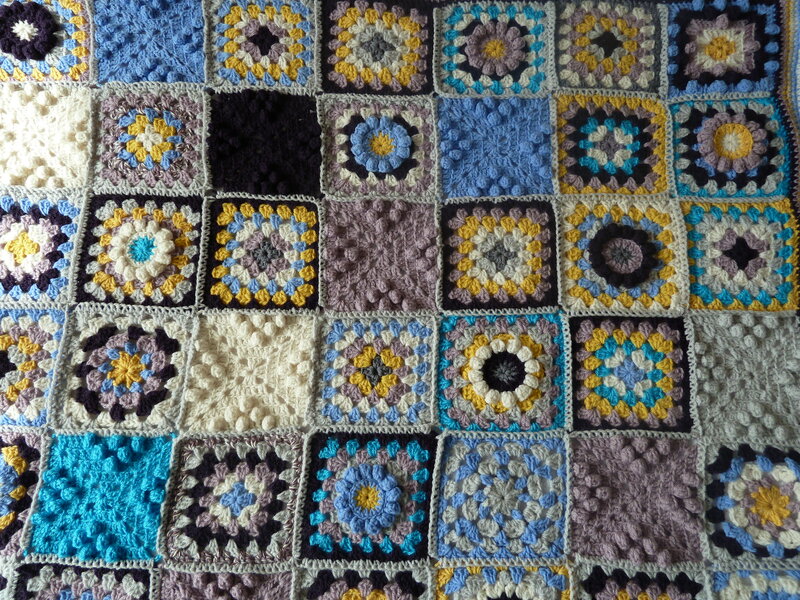 I’ll be making this up into a proper cushion over the next week or so, so I’ll take photos as I go for your delectation. 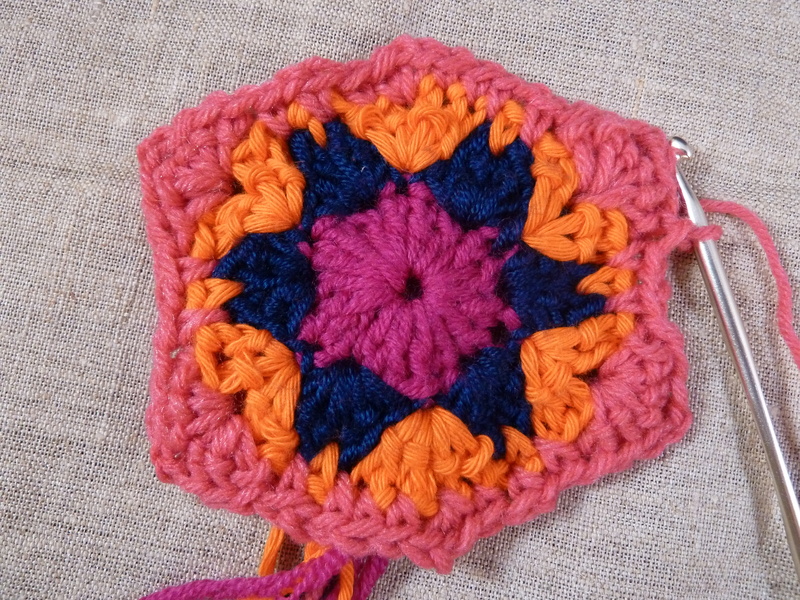 For now though I just thought I’d show you my progress, and express my particular love for the cerise, pink, orange and sand colour combo. It’s a bit like jam with cheese. You wouldn’t think it would work but it really really does. 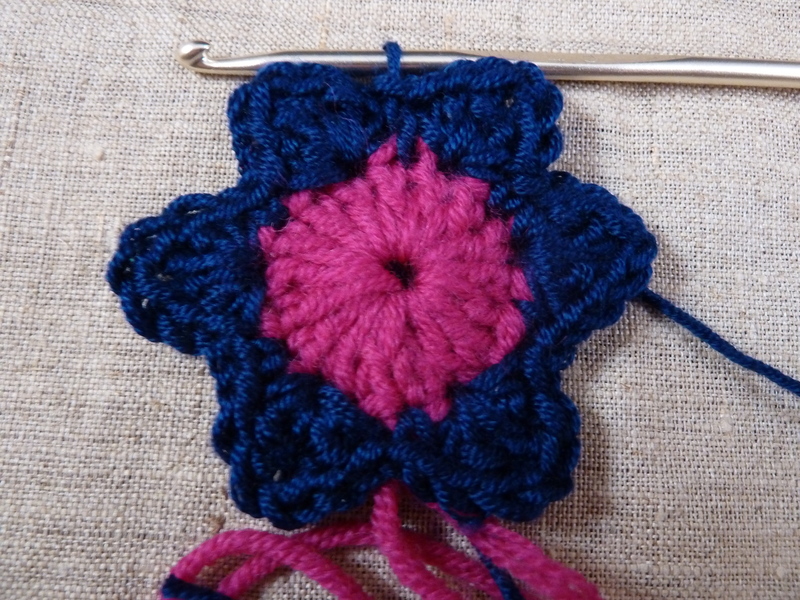 Careful with these hexies, they’re Moorish! Do you see what I did there? Oh, nevermind. Despite the fact that I have never actually been to Morocco (one for the bucket list), I am a total sucker for Moroccan pattern. 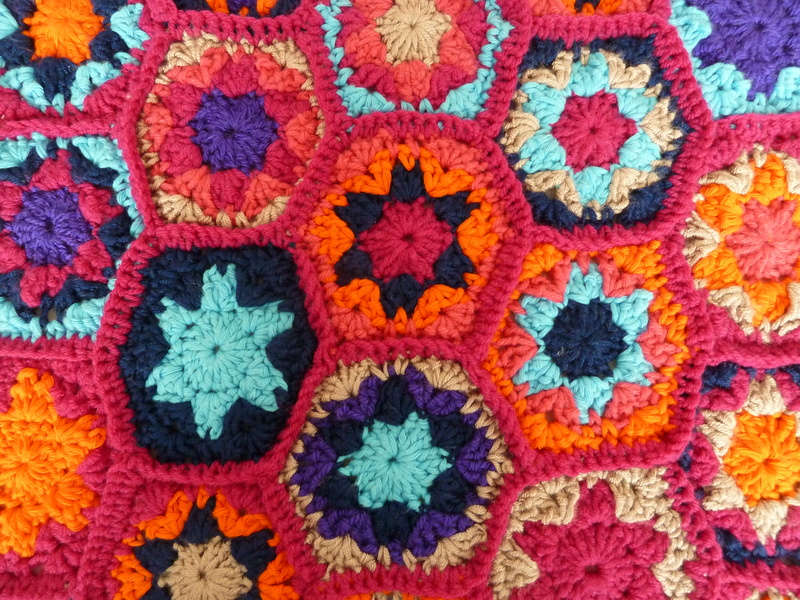 I’ve explored this theme in my crochet before, with pouffe the magic dragon, but the simple fact is I can’t get enough of the warm colours and intricate, interwoven shapes so I’ve revisited it once again this week. The style suits the medium brilliantly, although I doubt they have much call for thick woolly blankets in North West Africa. 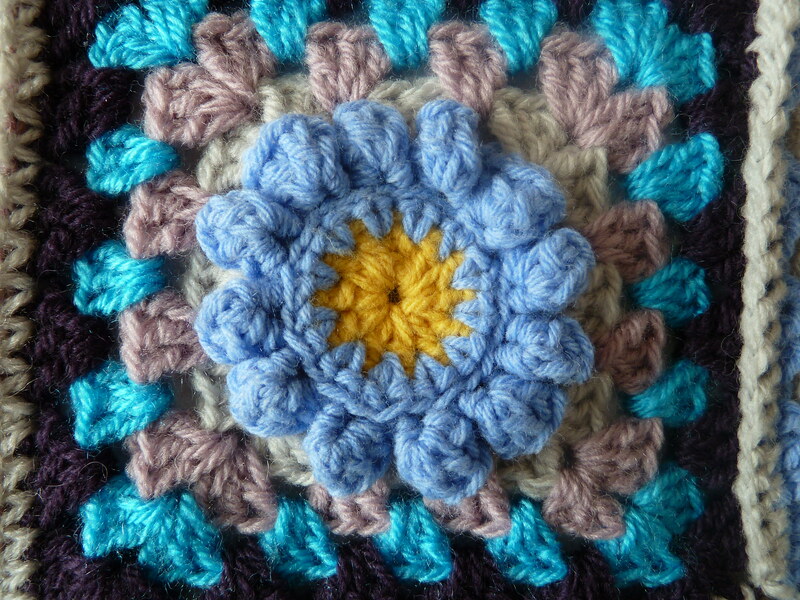 Here’s my design for a lazy hexagon granny. 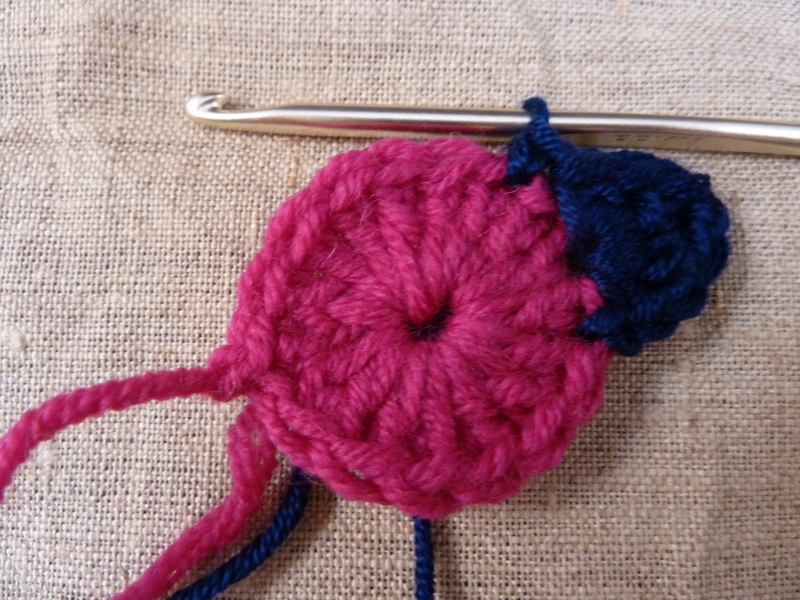 I’ve called it a lazy hexagon because it looks slightly as if it’s slouching, and also because it’s not very difficult to do – don’t be put off by the final round. It might look complicated, it’s not. Promise. 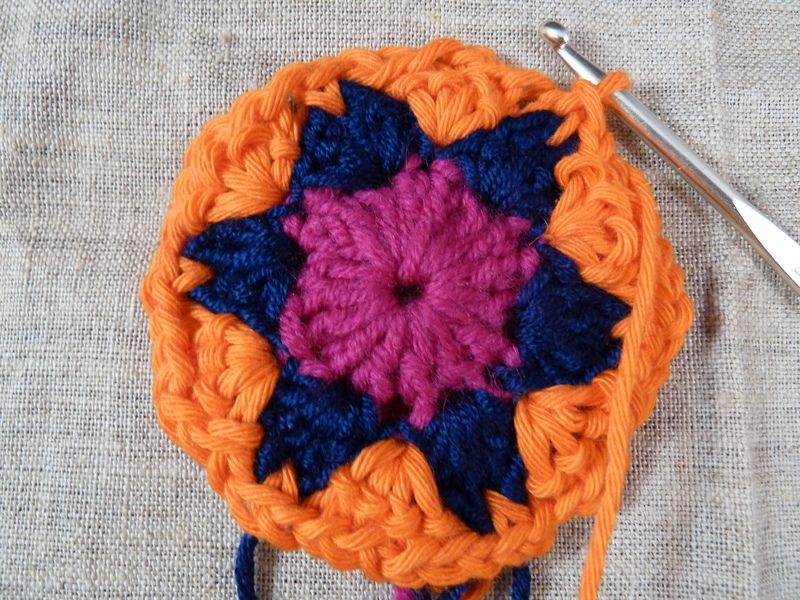 I am currently working on a cushion to showcase the beauty that is Leilah. I’ll post an update soon. 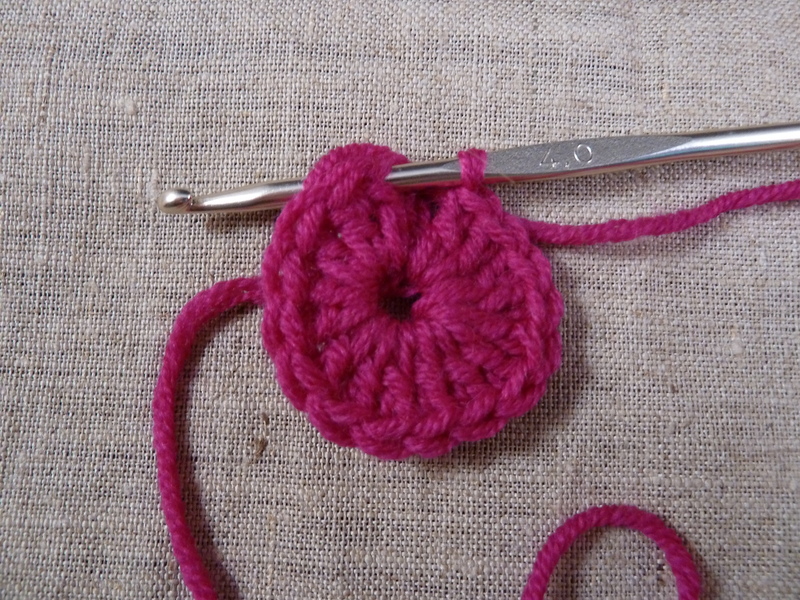 In the meantime, if you decide to have a go at this pattern I’d love to hear how you found it. Round 3: Join colour 2 with 1sc in any ch, *( 1sc, 1dc, 1tr, ch1, 1tr, 1dc, 1sc) in next ch, skip next ch, 1sc* repeat from * to * all the way round, join with ss in sc to form a round. Round 4: Join colour 3 with a sc in any ch1 space between 2 tr,*ch1, 2dc in next sc, ch1, 2 dc in same sc, ch1, sc in next sc* rep from * to * all the way round, join with ss in sc to form a round. Round 5: Join colour 4 in any ch1 space between 2 dc, ch2, 2dc in same space, ch2, 3dc in spame space, sc in next ch1 space, ch1, sc in next ch1 space, (sc in next ch)x2, in next ch1 space (sc,ch1, sc), sc in next ch, sc in next ch1 space, ch1, sc in next ch1 space, (3dc, ch2, 3dc) in next ch space between 2 dc, sc in next ch1 space, ch1, sc in next ch1 space, (3dc, ch2, 3dc) in next ch space between 2 dc, sc in next ch1 space, ch1, sc in next ch1 space, (sc in next ch)x2, in next ch1 space (sc, ch1, sc), sc in next ch, sc in next ch1 space, ch1, sc in next ch1 space, (3dc, ch2, 3dc) in next ch space between 2 dc, sc in next ch1 space, ch1, sc, in next ch1 space, join with ss in top of ch2 to form a round. 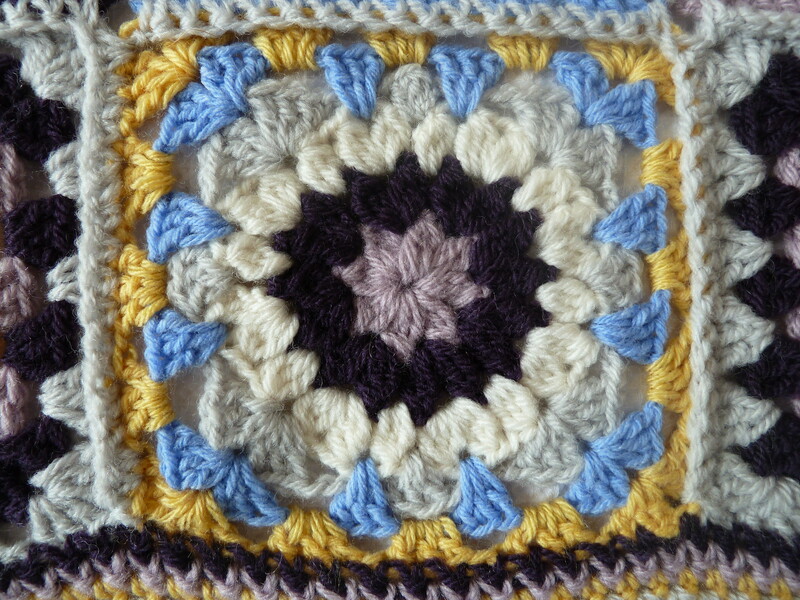 Here is the pattern for the skull square in my Day of the Dead Blanket (see archive for more on that beauty). 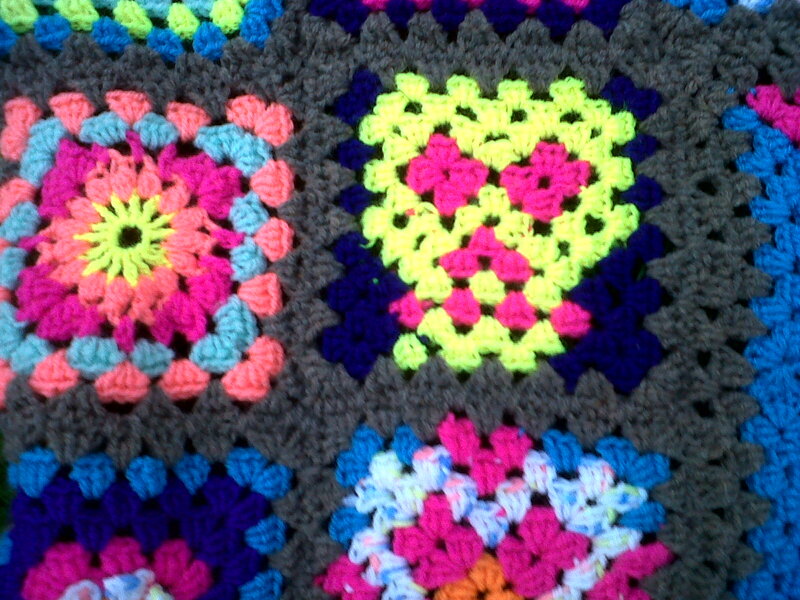 I used nasty neon DK for my blanket, but any highly contrasting colours would work just as well. You could probably use this pattern to make some decorative Halloween bunting if you were so inclined. Hmmmn, there’s an idea! 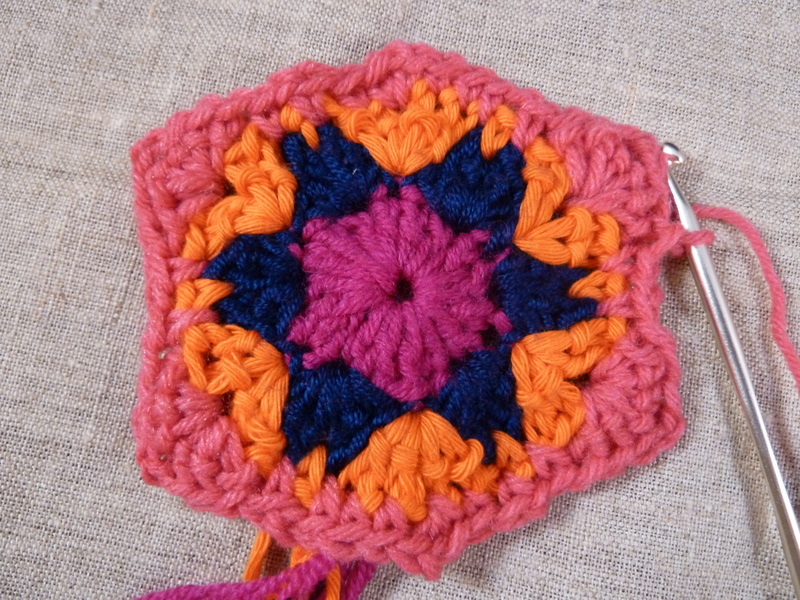 These squares employ a kind of Fair Isle technique I guess, in that you are working more than one colour, and so need to carry the colours you are not using with you as you crochet, twisting them behind the stitch so you are ready to pick them up at any time. This can seem a little complicated at first, but just as with most of these things, you’ll soon get the hang of it. 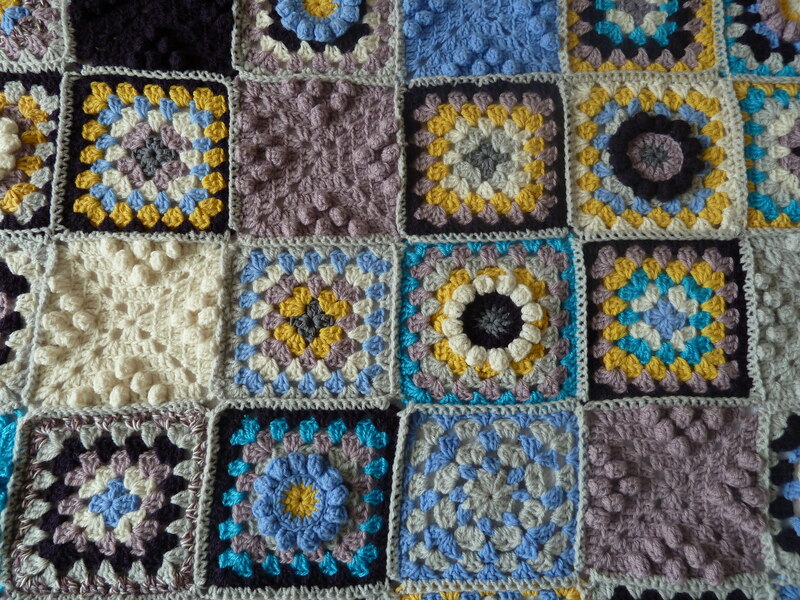 Once you’ve made one of these skull squares you’ll be able to make as many as you like. They are a bit addictive. Ch2, 2 dc in ring, ch1, (3 dc in ring, ch1) x2, join colour 2, 3 dc in ring, ch 1, bring colour 1 forward, join with ss to form a round. 2. Ch2, 2dc in corner, ch1, bring colour 2 forward, (3dc, ch1, 3dc) in next corner space, ch1, (3dc, ch1, 3dc) in next corner space, ch1, bring colour 1 forward 3dc in corner space, ch1, bring colour 2 forward 3dc in same corner space, ch1, 3dc in last corner ss to join and form a round. 3. Bring colour 1 forward, ch2, 2dc in corner, ch1, 3dc in same corner, ch1, 3dc in next gap, ch1, bring colour 2 forward (3dc, ch1, 3dc) in next corner, bring colour 1 forward, ch1, 3dc in next gap, ch1, bring colour 2 forward, (3dc, ch1, 3dc) in next corner space, ch1, bring colour 1 forward, 3dc in next gap, ch1, (3dc, ch1, 3dc) in corner space, ch1, 3 dc in next space, ch1, join with ss in top of chain to form a round. Cast off. 4. With colour 1, 1sc in 1st gap following the bottom right corner, ch2, 2dc in gap, 1ch, 3dc in next gap, ch1, (3dc, ch1, 3dc) in next corner space, ch1, 3dc in next gap, ch1, 3dc in next gap,ch1, (3dc, ch1,3dc) in next corner space, ch1, 3dc in next gap, ch1, 3dc in next gap, ch1, join colour 3, 3dc in corner, ch1, join colour 2, 3dc in same corner space, ch 1, 3 dc in next gap, ch1, 3 dc in next gap, ch1, 3dc in next corner space, ch1, bring colour 3 forward, 3dc in same corner space, ch1, join with ss to form a round. Cast off. (you’re now only working with colours 1 and 3. 5. With colour 1 sc in central gap on right hand side, ch2, 2dc in same space, 1ch, 3dc in next space, ch1, (3dc, 1ch, 3dc) in next corner space, ch1, 3dc in next space, ch1, 3dc in next space, ch1, 3dc in next space, ch1, (3dc, 1ch, 3dc) in next corner space, ch1, 3dc in next space, ch1, 3dc in next space, ch1, join colour 3, 3dc in next space, ch1, (3dc, 1ch, 3dc) in next corner space, ch1, bring colour 1 forward, 3dc in next space, ch1, 3dc in next space, ch1, 3dc in next space, ch1, bring colour 3 forward, (3dc, 1ch, 3dc) in next corner space, ch1, 3dc in next space, join with ss to form round. 6. Ch2, 2dc in gap, ch1, 3dc in next gap, ch1, 3dc in next gap, ch1, (3dc, 1ch, 3dc) in next corner space, ch1,bring colour 1 forward, 3dc in next gap, ch1, 3dc in next gap, ch1, 3dc in next gap, ch1, 3dc in next gap, ch1, bring colour 3 forward, (3dc, 1ch, 3dc) in next corner space, ch1, 3dc in next space, ch1, 3dc in next space, ch1, 3dc in next space, ch1, 3dc in next space, ch1, (3dc, ch1, 3dc) in next corner space, bring colour 1 forward, ch1, 3dc in next space, ch1, 3dc in next space, ch1, 3dc in next space, ch1, bring colour 3 forward, 3dc in next space, ch1, (3dc, ch1, 3dc) in next corner space, ch1, 3dc in next space, ch1, join with ss in top of ch2, cast off. 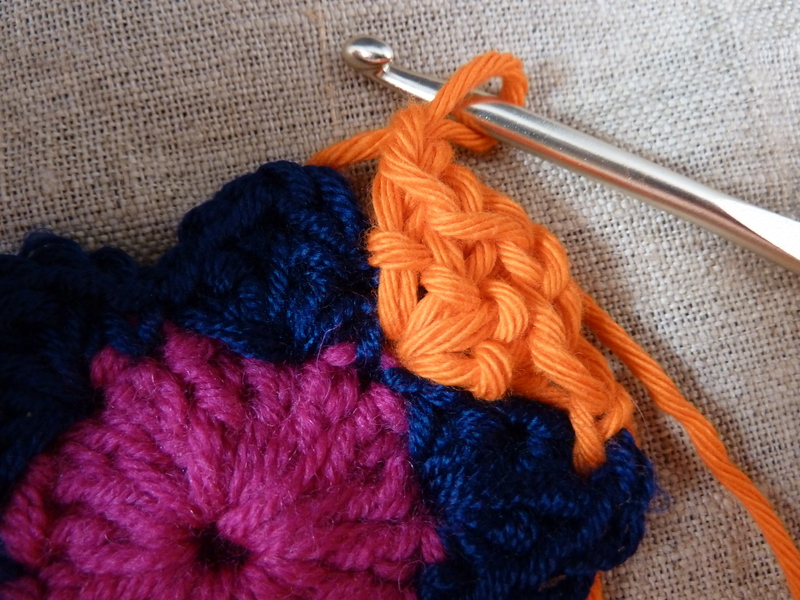 Hide ends with bodkin.